"Whatever happens. I'll find you. I have to find you." Yes!! The first trailer has arrived online for the new action film from Indonesia called Headshot, starring Iko Uwais from The Raid, directed by the guys who made that totally crazy "Safe Haven" segment of V/H/S 2. The film is premiering at Midnight at the Toronto Film Festival starting this week, so this trailer is a nice tease for everyone who isn't there, but it will make you wish you were seeing this. The cast includes Julie Estelle, Sunny Pang, Very Tri Yulisman and others. This looks so awesome!! There's glimpses of badass action scenes and shootouts in this and I can't wait to see it. Not sure if it will live up to The Raid movies, but that doesn't really matter because Iko Uwais is back. Uwais plays a young man who washes ashore, an amnesiac with a serious head injury whose past comes back to haunt him shortly after being nursed back to health by a young doctor. Violence ensues. Sweet, sweet violence. 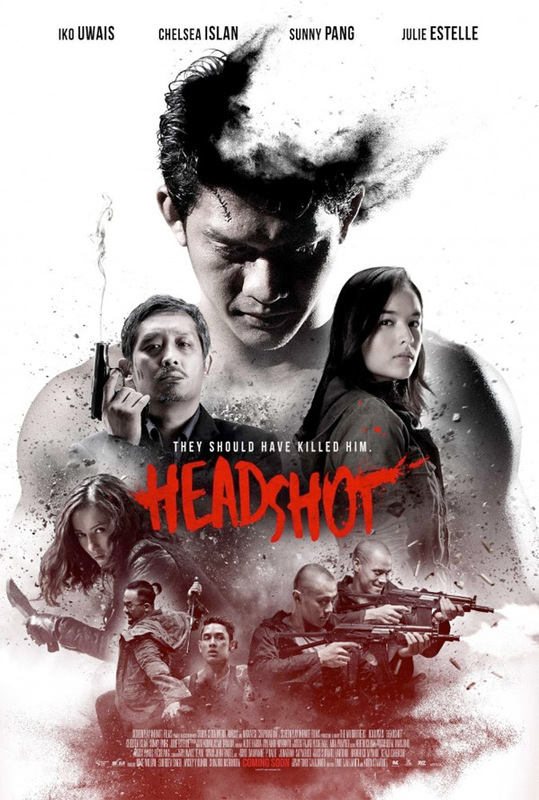 Headshot is co-directed by Indonesian filmmakers who are known as "The Mo Brothers", specifically Kimo Stamboel & Timo Tjahjanto, of the films Killers, Macabre, Dara, as well as the "Safe Haven" segment of V/H/S 2 previously. The screenplay is written by Timo Tjahjanto. This film is premiering at the Toronto Film Festival this year in the Midnight Madness category. It already opened in Indonesia back in July, but doesn't have any US release info available yet. Stay tuned for updates. Who wants to see it? Looks very Raid like. Safe haven was awesome. The Raid was mental. This seems to have the same level of violent madness. I kept hearing Daniel Day-Lewis saying "I will find you" from Last of the Mohicans . . .
Or was that Daniel Day-Lewis driving off in the Eat Me car?. . . I get confused. Woohoo! I get to watch this tomorrow at TIFF. In case anybody cares, huge fan of the Raid & Raid 2 here. Caught the screening 2 days ago. I enjoyed it overall. Too melodramatic and cheesy at times for me to compare to the Raid. Felt like a fusion of chinese and indonesian cinema, which I believe didn't help it. However, I feel like it did its job and that's keeping Iko and Silat's legacy alive in film for those just discovering the Raid. I'd give it a 7. Again, I enjoyed myself, especially in the theatre with the filmmakers and actors.